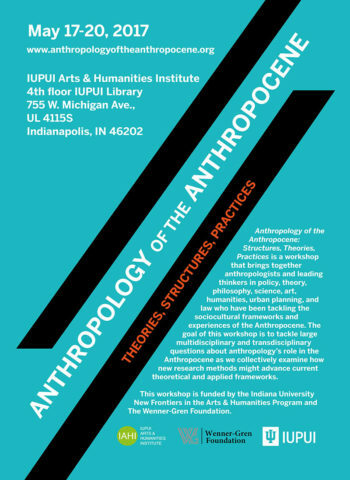 Anthropology of the Anthropocene: Structures, Theories, Practices is a workshop organized by the IUPUI Arts and Humanities Institute (IAHI) that brings together anthropologists and leading thinkers in policy, theory, philosophy, science, art, humanities, urban planning, and law who have been tackling the sociocultural frameworks and experiences of the Anthropocene. The goal of this workshop is to tackle large multidisciplinary and transdisciplinary questions about anthropology’s role in the Anthropocene as we collectively examine how new research methods might advance current theoretical and applied frameworks. This workshop is a project of Rivers of the Anthropocene.